MicroVAX 3100 systems offer enhanced distributed computing capabilities and flexibility. They support more than 10,000 commercial and technical applications across local or wide area networks. MicroVAX 3100 systems support add-on synchronous options for wide area communications and asynchronous options, including modem options for terminal and printer connections. Networking allows communications in a variety of environments. PC clients based on MS-DOS, OS/2, and Macintosh can be connected to the MicroVAX 3100 system, enabling the entire business to share information. 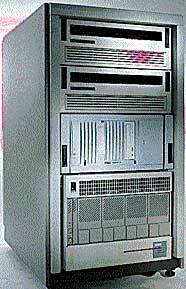 The Rackmount MicroVAX 3100 systems included 64 MB or 128 MB of memory, 1.05 GB disk, CD-ROM drive, OpenVMS base license, and NAS 200 software. The Rackmount VAX 4000 Model 108 included 64 MB or 128 MB of memory, 2.1 GB DSSI storage with an embedded DSSI-to-SCSI adapter, 2.1 GB SCSI disk, CD-ROM drive, OpenVMS base license, and NAS 200 software. � Copyright 2007-2010 MIT Limited,UK. All rights reserved.